ILGA - The International Lesbian, Gay, Bisexual, Trans and Intersex Association (ILGA) was set up in 1978 in England to provide a forum for LGBT activist groups to network and exchange information. The World Conference was the forum where members came together and was the vehicle by which ‘action’ was initiated. ILGA became ILGA in 1986 and in the 1980s, its work expanded to regional meetings and projects beyond the world conference. Today, ILGA is a world-wide federation of more than 1000 local, national and international member organizations, representing every continent and around 90 countries. 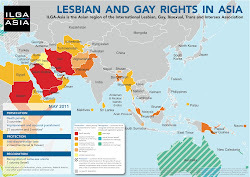 ILGA-Asia - We have been the largest and the most diverse in terms of coverage area. It had its first regional conference in Mumbai, India, 2002; its second regional conference in Cebu, Philippines, 2005. The third regional conference was held on 24-27 January 2008 in Chiang Mai, Thailand. Around 160 LGBT activists from Asia [representing 16 countries] and beyond gathered to discuss LGBT issues under the motto “Equality in Diversity Now!”, and to elect a working Board for the first time. The fourth ILGA-Asia regional conference “LGBT Asia Moving Forward!” was scheduled in Surabaya, Indonesia, 26-28 March 2010. About 150 LGBTQI activists from all over Asia came to participate in this 3-days conference. Unfortunately, it was disbanded in the first day due to a combination of inaccurate media reports and participants safety being threatened by local Islamic fundamentalists. Over 100 LGBTQI activists from all over Asia are expected to participate in this 3-days conference. At present, there are around 150 LGBT organizations in Asia that are members of ILGA. Special attention will be given to equal representation of women, transgender and intersex persons. The conference is not exclusive to LGBTI-identified individuals but it also welcomes all people who support the rights of all gender and sexually marginalized groups. The conference is open to people of all sexual orientations and gender identities supportive of LGBT issues and concerns in Asia. 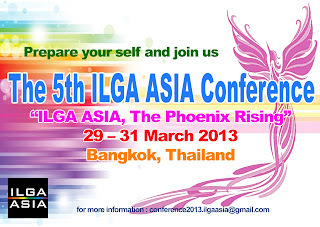 ILGA’s conferences are traditionally opened for all, members or non-members of ILGA. However, some agenda caucuses, such as, ILGA MATTERS, are for ILGA members only. Activists can either fund their participation by their own means or apply for a scholarship. This time, the conference will have a sober character and will be focusing on practical issues such as strengthening ILGA-Asia and its Board. There will also be a one-day pre-conference seminar on Working towards the next UN resolution on SOGI, co-organized by ILGA-Asia and ARC International; participants will be selected and invited in a later stage. The ILGA-Asia Board and the Organising Committee (OC) composed of Rainbow Sky Association of Thailand (RSAT) and ANJAREE (Thailand). To move Asia’s LGBTQI communities and organisations towards a common vision, mission & goal, and to draft an action plan for cooperation amongst ILGA-Asia members. 1. Shared vision and prioritisation of issues for ILGA-Asia Region. 2. New ILGA members, especially from West Asia sub-region. The different registration fees are applied according to different statuses: 1) Individuals: who are not belonging to any organisation will be charged by nationalities. 2) Organisations: participants from organisations will be charged depending on the actual location/residence of the organisation. 3) Local/regional offices run by international bodies such as UN, EU as well as INGOs will be considered as Non-Asian, even if they reside within Asia. A 20% discount will be given to early bird registration (one week before conference) of full members of ILGA who have paid their membership dues up to 2012. Groups decide themselves which person should represent them at the conference, including which person should apply/benefit from a scholarship. 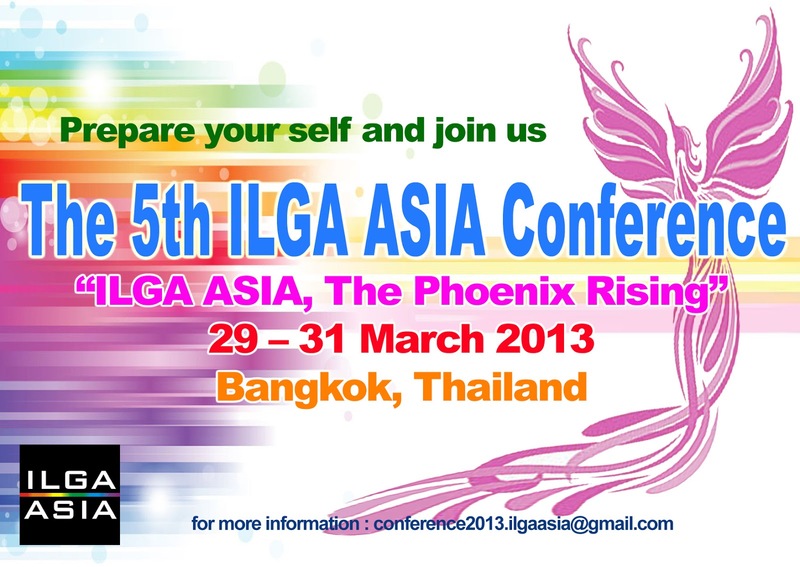 ü To apply for a scholarship to attend the conference, fill in the scholarship section of the form and submit to conference2013.ilgaasia@gmail.com before 1 February 2013. See scholarship details in the how to apply for a scholarship. Priority will be given to ILGA members and/or approved paper presenters. Applicants applying for partial scholarship are also more likely to get it. ü To submit an abstract for a paper or workshop, send a 300-word abstract in the required format and submit to conference2013.ilgaasia@gmail.com on or before 1 February 2010. See paper and workshop presentation details in the call for papers & workshops section. ü To become an ILGA member, visit ilga.org See ILGA membership details in the how to become an ILGA member section.